"Armor Wars" is a seven-issue Iron Man story arc written by David Michelinie and Bob Layton with art by Mark D. Bright and Barry Windsor-Smith and published by Marvel Comics. The arc first appears in Iron Man #225-#231. Cover art to Iron Man #225. While "Armor Wars" is the popular name for the storyline and is the name used for the trade paperback collection, the actual story is referred to as "Stark Wars" within the issues themselves. The source of the name "Armor Wars" stems from the fact that the storyline was advertised in other Marvel titles with full page ads reading: "TIME FOR THE AVENGER TO START AVENGING. THE ARMOR WAR BEGINS IN IRON MAN #225." The storyline ran through Iron Man (Vol. 1) #225 (December 1987) to #231 (June 1988), plotted by David Michelinie and Bob Layton with art by Mark Bright, though much of the groundwork for the story itself occurred during Iron Man #219-224. Iron Man encounters the Spymaster, who steals the Stark technology. Iron Man also encounters Force, which sets up the plot of "Armor Wars" in the following issues. An epilogue to the storyline was published in Iron Man (Vol. 1) #232 (July 1988), co-plotted by Michelinie and Barry Windsor-Smith with art by Windsor-Smith. "Armor Wars II" followed in issues Iron Man (Vol. 1) #258 (July 1990) to #266 (March 1991). After Iron Man finishes a training session in order to impress a general, he returns to Stark Enterprises. Upon analyzing Force's armor, Tony discovers that the armor is based in part on his own designs, stolen before his current Iron Man armor was developed. He compiles a list of several armored criminals: Beetle, Shockwave, Doctor Doom, Stilt-Man, the Crimson Dynamo, Controller, Mauler, Professor Power, Titanium Man, the Raiders, and others. After finishing another training session, Iron Man teams up with Scott Lang to find out who stole his designs. Tony uncovers that the Spymaster was the one who sold Tony's designs to his rival Justin Hammer. Iron Man goes after the Stilt-Man, who is attempting to break into a high-rise office building. Stilt-Man is easily defeated when Iron Man chops off one of his legs, and he renders the armor inoperable with a "negator pack" which destroys Stark circuitry within. A short time later, Iron Man battles the Controller whom he knocks unconscious in front of a crowd and negates his armor. Then, unable to pursue legal means to reclaim his technology, Tony plans to take out every armored warrior who is suspected of having his designs. The Raiders invade an Air Force plane, drawing Iron Man's attention. Iron Man defeats the Raiders using negator packs, disabling his stolen technology. Tony finds out one name is missing from Hammer's database due to a glitch in the upload. Tony and Jim Rhodes run a search of other armor-using individuals, which prompts Tony to identify the government-sponsored Stingray as the best candidate, as other known armored heroes and villains are either not advanced enough or would not use others' designs. Tony's actions draw the West Coast Avengers' attention. Tony declines the Avengers' offer of assistance, saying that his problems are personal. Iron Man travels to the Hydro-Base, where he confronts Stingray and insists that he be allowed to test his armor for stolen circuitry. When Stingray refuses, Iron Man chases him throughout the ocean and releases electricity cybernetically to incapacitate him. He then unsuccessfully attempts to negate Stingray's armor; Stingray's armor really was not based on Stark's designs. Due to this incident, Tony is informed that the Government wants Iron Man to be shut down. Reluctantly, Tony announces that Iron Man's contract has been terminated. Iron Man ruthlessly attacks the Beetle as he tries to steal exotic pieces of art. Beetle attempts to escape Iron Man's wrath, but is defeated and his armor negated. Iron Man returns to his base, where he has a talk with Hawkeye. Nick Fury of S.H.I.E.L.D. meets with Tony and demands that Iron Man be handed over to him for attacking a government agent (Stingray). Tony gives Fury Iron Man's file, having prepared a fake identity for Iron Man as 'Randall Pierce' in the event of such a scenario. Tony secretly intends to destroy S.H.I.E.L.D. 's Mandroid armors - which he also designed - to prevent their technology being replicated. He tells Fury that 'Pierce' has set up a hidden base in New York and suggests Fury dispatch the Mandroids to bring Iron Man in. Tony, as Iron Man, engages the Mandroids and disables all five, much to Fury's dismay. Tony fakes evidence to suggest that Iron Man knew about their plan because he planted a bug in their equipment. Later, Tony arranges to create a new shield for Captain America. (Note: The "Nick Fury vs S.H.I.E.L.D." mini-series hinted the "Fury" in this story was a Life Model Decoy, the real Fury claiming to have no idea of these events). The Captain (which was an alias Rogers used after abandoning the Captain America persona at the time) thanks Tony for the new shield. Meanwhile, the villain Electro is defeated by the Guardsmen and is imprisoned at the Vault, though it was Rhodes who disguised himself as Electro to sneak into the Vault. Iron Man sneaks into the Vault to neutralize the Guardsmen- as with the Mandroids, he seeks to prevent others replicating their technology- but he is caught by two Guardsmen. Rhodes accidentally breaks out all the prisoners at the Vault after he tricks a Guardsman who spotted him earlier. While battling a Guardsman, Iron Man catches the attention of the Captain. Rogers agreed with Tony's motives, but Rogers calls his methods reckless and dangerous. While trying to save a Guardsman from dying, Iron Man violently knocks him out, rendering the Captain in a coma. The West Coast Avengers arrives at Tony's home, where they try to make Tony explain himself. Tony tells them he found out about the armor being stolen after analyzing Force's armor. The West Coast Avengers remained hesitant to tell Tony he's off the team after he leaves. The Crimson Dynamo and Titanium Man meets with the president, who tells them to defend the people of Russia after revealing that Iron Man is going to Russia, but Titanium Man disagrees, saying that Iron Man is too dangerous for anybody to handle, preferring to remain in hiding. Tony invents a modified version of the Stealth armor to sneak into Russia undetected. Iron Man goes after Titanium Man, but he fought back. While Iron Man was distracted by the Crimson Dynamo, the Titanium Man's pilot dons the armor and leads a double assault on Iron Man. Iron Man defeats the Crimson Dynamo and negates his armor. Distracted, Iron Man is attacked and overwhelmed by Titanium Man. Iron Man tries to escape, but Titanium Man grabs him. Iron Man flies up to space to try to shake Titanium Man off of him. However, Titanium Man's armor overheated, setting him on fire. The Titanium Man armor explodes, killing the pilot. Enraged, the Russian soldiers try to attack Iron Man, but he escapes. Back at the West Coast Avengers Mansion, Hawkeye states that Iron Man is stripped of his membership as a West Coast Avenger. Test pilot Jack Taggert demonstrates a flight simulator to the U.S. Government. Edwin Cord, Tony's rival, tells a general to jumpstart the plan that can defeat Iron Man once and for all. Later, Jack suits up as Firepower to demonstrate the armor's power. Later that day, Firepower lures Iron Man into a trap, Iron Man having identified Firepower as the result of the name missing from Hammer's list. Iron Man blasts Firepower, but he strikes back. Iron Man struggles to fight Firepower due to his superior weaponry. In the nick of time, Iron Man escapes Firepower's wrath with the help of Rhodes. Unfortunately, Iron Man leads a final assault on Firepower. In retaliation, Firepower launches a nuclear missile at Iron Man, seemingly killing Iron Man in the process. It is revealed that Tony survived the explosion, but with severe injuries. Rhodes attempts to tell Tony to fight back as Iron Man, but Tony refused, saying that the world got their wish and feeling that it is too dangerous to create new armor. Elsewhere, the U.S. Government tries to tell Cord to hand over Firepower, but Cord declined, stating that he's not done with Firepower yet. Firepower destroys several of Stark related tech, which led Tony to believe that Firepower is behind all this. At the same time, Firepower destroys a truck full of Stark tech, surprising Tony. Firepower reveals to Tony that Cord wants revenge on both Tony and Iron Man for destroying Cord Conglomerate (as seen in Iron Man #145). Angry, Tony invents another version of the Iron Man armor to combat Firepower. Days later, Firepower attacks Stark Enterprises' San Francisco bureau only to face off against the "new" Iron Man. After a lengthy battle, Iron Man defeats Firepower, but during the fight, Iron Man damaged Firepower's backpack, which was carrying a neutron bomb. Iron Man disables the bomb, but Firepower claims he is nothing like the "other" Iron Man. Iron Man angrily tears him out of the Firepower suit. That night, reflecting that he will continue as Iron Man due to the dangers that only Iron Man can handle, Tony was glad he could get a good night's sleep, and he falls asleep, ending the story. The storyline was collected in a trade paperback in 1990. The book quickly fell out of print and would not be re-released until 2007, when Marvel released a new printing (with a new cover) (ISBN 0-7851-2506-X). The book collects issues #225-#231 as well as the epilogue to the story presented in issue #232. The Prologue story (#215-224) was published in a trade paperback in March 2010 (ISBN 978-0-7851-4257-7). A collection of the sequel story, Armor Wars II (#258-266), was released in May 2010 (ISBN 978-0-7851-4557-8). There was an issue called "What If Iron Man Lost the Armor Wars" in which Justin Hammer still manages to obtain Stark Technology. Scott Lang ends up passing out from the knock-out gas when gathering info on who has the stolen technology and ends up captured by Justin Hammer's men. When Tony Stark dons his Iron Man armor, Justin Hammer takes control of it and manipulated the Iron Man armor to reveal his identity and place a mind-control collar on him when it turns out that Scott Lang and his daughter Cassandra are his hostages. Justin Hammer then makes Tony Stark destroy Stark Enterprise, with James Rhodes now in a coma, and reveal his identity to the press. Afterwards, Tony Stark shaved his mustache and dyed his hair yellow after discarding the armor and the collar. When A.I.M. steals the technology from Justin Hammer, they start targeting the armored warriors, and one of their attacks kill two of the Raiders. Tony meets up with Controller, Mauler, Stilt-Man, Beetle, Titanium Man, Crimson Dynamo, and the surviving Raider to infiltrate the A.I.M. Omega Branch, where Tony takes control of the Firepower armor. When he suggests to the armored villains to turn themselves in, they attack Tony Stark, only to be stopped by Captain America, Wonder Man, and Henry Pym. Hawkeye tells Tony that they would have to take him to jail for his actions. Rather than attack the heroes, Tony Stark decides to take his chances in court, for he knows that if he did attack, Justin Hammer would have won. The first issue of the two-part new-artist-introduction series Breaking Into Comics the Marvel Way has a short story that shows a final resolution to the Armor Wars, depicted as happening shortly after the events. Tony is recording a video will that declares that should events ever escalate to such a point again, he would activate a program called Project Icarus that would seal him in a suit of his armor, activate his other armors and all technological devices derived from Stark technology and all of them would fly directly into the sun. A 4-issue mini-series titled Iron Man & The Armor Wars, a modernization of the Armor Wars concept for a new audience, debuted in August 2009, written by Joe Caramagna with art by Craig Rousseau. A hardcover collection of the story was published in February 2010 (ISN 978-0-7851-4448-9). A four-issue mini-series titled Ultimate Comics: Armor Wars began in September 2009. It is written by Warren Ellis. It takes place after Ultimatum where Iron Man tries to find his remaining armors and save his enterprise. A new Armor Wars mini-series appears as part of the 2015 Secret Wars storyline. The Battleworld domain associated with this mini-series is called Technopolis where its inhabitants are forced to wear Iron Man armors due to a disease and will have that area's Tony Stark and Arno Stark as rival manufacturers. In the futuristic domain of Technopolis, War Machine (who is the Thor Corps operative of Technopolis) answers a challenge to fight Titanium Man while suspecting that he's being tested. Titanium Man mocks War Machine's position as the Thor of the Domain of Technopolis, but is easily defeated. Iron Man arrives and the two banter about Tony's political position as Baron before talk turns to War Machine's gut feeling over the reasoning behind the duel. Tony suspects Kingpin, but Jim is unsure. They then discuss vigilantes in Technopolis including Spider-Man and Radar Devil. Iron Man suggests they should be arrested, but informs War Machine that he's off to meet with Spider-Man anyway. Meanwhile, Iron Man's brother Arno Stark meets with Kingpin at Stark Tower and assesses the valuable data compiled by having paid Titanium Man to fight War Machine. Kingpin assures Arno that Titanium Man's silence has been bought and that failsafes are in place. Elsewhere in the city, Spider-Man is late for work as he heads to his planned meeting with Iron Man. He reveals himself to be Peter Urich and plans to tell Tony that he had uncovered the truth about the origin of the disease that forced Technopolis' citizens to wear armor just to survive. It was revealed that Baron Tony Stark and Arno Stark's father Howard Stark encouraged a friendly rivalry between them to promote affection, but ended up creating a bitter never-ending competition between the two brothers to provide Technopolis with life and mobility. Tony was chosen to become the domain's Baron during Howard's sickness that ultimately took his life. Tony promised Howard to allow Arno free market in the city as long as he didn't break any laws. Even though Arno constantly opposed Tony and even provided technology for criminals, Tony had not been able to prove his brother's illicit activities and opposed the idea to use his power as Baron to get rid of Arno. Also, Stark had tried to acquire Mobairu Yōsai Mechaniks to help Kiri Oshiro (who was the daughter of Rumiko Fujikawa) as well as to protect the company from Arno. Spider-Man was later killed while escaping Kingpin's men. When Spider-Man's body was found, the autopsy and the analysis of the memory banks in his armor revealed that he had been killed because he had discovered the origin of the disease affecting the residents of the domain. Meanwhile, Arno Stark had sent Stingray to infiltrate the workshop of Kiri Oshiro, the owner of Mobairu Yōsai Mechaniks which is one of the few companies not under Stark's umbrella. Stingray's mission was to discover what technologies was she developing as Stark had recently tried to buy the company. He was defeated by Kiri when he tried to kill her friend Lila Rhodes. As Grand Marshal James Rhodes informed Kiri Oshiro of the lead on Spider-Man's murderer, Tony Stark confronted Arno Stark for Stingray's attack on Kiri. Some of the information decrypted from the memory banks of Spider-Man's suits made mention of the Kingpin of Crime which was a reason valid enough to make Rhodes pay a visit to Fisk. However, Jim found opposition in the form of Fisk's armored henchmen. Rhodes expected Fisk's opposition and deployed the War Machines from the Hall of Law and Order to assist him. After being defeated by War Machine, Kingpin made clear at his deathbed that didn't have anything to do with Peter's death. War Machine returned to the Hall of Law and Order to continue investigating the memory banks when he was confronted by Tony Stark. While Arno dealt with the War Machines, Tony revealed to War Machine the link between Technopolis' disease, his father's supposed hand in its creation, and Spider-Man's death. Tony ultimately killed War Machine to prevent the domain from learning the truth. However, War Machine had been able to record and transmit Stark's confession sending it to Kiri. Kiri and War Machine's niece Lila Rhodes unleashed Kiri's secret weapon, a giant suit of armor to stop Tony Stark and Arno Stark once and for all. As the fight between the Starks and Kira and Lila's giant suits of Armor commences, it's revealed all of Tony Stark's evil machinations. It is revealed that Howard Stark was the creator of the Technopolis Virus and he created it so the city's population would be reliant upon it to survive. The problem was the virus was proven too virulent and hence everyone who caught it instead of the small populace it was intended for became ill including the Starks. As the fight continually rages on. Tony also admits to Kiri why he murdered Spider-Man, Kiri's parents and Peter's father Ben Urich. Tony Stark had implemented a neural inhibitor in the Armor everyone was fitted for and it made the wearer forget if ever they began to question where the virus started from. Kiri's parents who were programmers were able to bypass the inhibitor as was Peter whose Spider-Man armor was capable had to be silenced along with Ben Ulrich who was a news reporter approached with the truth by Kira's parents. Tony Stark also decides to tell Kiri believing he has the upper hand that he was playing both sides and the Kingpin was in his employ to keep tracks on her and his brother Arno. Like Arno, he also tried to hack into her files but was surprised he could never get past Kiri and Lila program's defenses hence the reason he wanted to purchase her technology. Kiri had already figured out this point and to her advantage while they are engaged in combat she incorporates a virus into the Stark's Armor weakening them. The Thor Corps members King Thor of Earth-14412, Storm of Earth-904, Stormbreaker Ray, and Thor of Earth-1610 arrive to deal with Tony and Arno. They are led away to be sentenced by Doom's law. It is also revealed Lila Rhodes is made a Thor Corps member (as her uncle previous), Happy Hogan is the new Sheriff, and Kiri is named new Baroness of Technopolis where she creates new and safer tech for its citizens leading them into a new age. The Armor Wars were adapted as a two-parter in the Iron Man animated series, with Hawkeye appearing in Captain America's place at the Vault. In this two-parter, the Ghost was the one who stole the armor designs from Stark Enterprises and gave them to Justin Hammer. After Crimson Dynamo allowed the heat-seeking missile to follow him into a missile silo resulting in an explosion that spread a radioactive cloud for miles, Nick Fury gave Tony Stark the remains of Crimson Dynamo's armor. Upon the analysis of the armor remains, Tony Stark suspects that other armored characters might be using his Stark Armor designs. Instead of Scott Lang finding out which armored warriors had the Stark armor designs, it was H.O.M.E.R. (who had tested his Negator Packs at the time of the discovery) who discovers this and printed out a list of every known armored warrior. 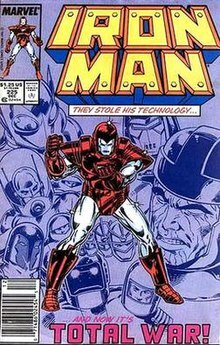 The armors of Controller, Beetle, Stilt-Man, Blacklash, Blizzard, the Guardsmen, and Stingray (whose armor was not based on Stark technology and only fell victim due to Stark's paranoia) were targeted by Iron Man as well as War Machine's armor. Justin Hammer created Firepower (an automaton rather than a man in armor) to take out Iron Man. After Firepower was destroyed, Iron Man then deleted the files of the Stark Armor designs from Hammer Industries' mainframe. The Armor Wars are also adapted in Iron Man: Armored Adventures. The Armored Adventures version of 'Armor Wars' lasts for 10 episodes in Season 2. The enemies young Stark fights during this version of the Armor Wars include the Ghost who steals Iron Man specs and discovers that Tony Stark is Iron Man. Ghost sells the specs to both Justin Hammer and Obadiah Stane but says he will not reveal Iron Man's true identity so that he can blackmail Tony when he inherits Stark Industries. Justin Hammer makes an armor with the Iron Man specs and becomes Titanium Man. Doctor Doom joins forces with Stane so he can attain the Iron Man armor operating system. Stane holds a "Guardsman Expo" to present three new armor-wears using recolored-past Iron Man designs: Force (Space-Armor), ShockWave (Stealth Armor), and Firepower (Hulkbuster armor), who were defeated by Iron Man, exposing their past as Maggia members, to which Stane claimed to be oblivious to. In the ninth episode entitled "The Hawk and the Spider", Hawkeye and Black Widow appear as thieves who are out to steal UI technology which provides direct neutral interfacing with machines such as the Iron Man armor though not as well as young Stark's own interface tech. Stane builds the Iron Monger armor which is revealed actually to be a direct upgrade from Crimson Dynamo armor (version 3) and is much larger than in the comic book and live action movie realities. In the eleventh episode "Fugitive of S.H.I.E.L.D." Black Widow returns stealing from General Fury and the S.H.I.E.L.D. Helicarrier. The Armor Wars conclude in the episode "Heavy Mettle" as Obadiah Stane discovers the identity of Iron Man. Stane steals Iron Monger, and is intent on destroying Tony once and for all. He fights Tony and James Rhodes, during which Justin Hammer joins the battle as the Titanium Man to boost the credit of the Titanium Man armor. In the end, Iron Monger and Titanium Man are both defeated, with Obadiah put into a coma and Justin temporarily stranded on a distant mountain. Iron Man 2 uses elements of The Armor Wars, with the fear of Stark's technology being duplicated prompting the U.S. government to attempt to appropriate his armor for their own use. Although Stark claims that his nearest rivals are a decade away from perfecting the technology, the villain Whiplash uses a power source identical to the one Tony uses to keep the shrapnel from his heart, and as a power source for his own armor, the original having been designed by both their fathers, and Justin Hammer seeks to build his own line of tech based on Tony's armor. Other countries like North Korea and Iran were shown trying to create their own suits, but without success. The Invincible Iron Man is loosely based on the Armor Wars II.